The North Canyon sprinters set their sights on excellence in every event from the 100m to the hurdles, and even the 800m. However, their performance at last year's AIA Track and Field State Championships cements their program as a full-blown powerhouse. At the most important meet of the season the Lady Rattlers' supergroup, who each finished on the podium for at least one sprinting event, handily won the D2 Girls 4x400 in a time of 3:46.08, taking down the State Record held previously by their crosstown rivals, the Chandler Wolves. It sealed the deal for their second consecutive D2 State Title with 94 points, and by the way, did I mention that the Girls 4x400m team was made up of sophomores? Delphine Dah ran the first leg of the Rattler's 1600m Relay. "I felt like I had to get us in a really good position," said Dah. Earlier that day, she ran her first performance under 57 seconds for lifetime best of 56.63 and a 4th place finish in the D2 Girls 400m Final. Dominique Mustin took the baton as the second leg. Earlier that afternoon, she had won the D2 Girls 800m run and finished third in the D2 Girls 100m Hurdles at the AIA State Track and Field Championships. "I wanted to say I was a State Champion and do my best. I don't think we went into that race saying we had to break the State Record but when you start something you gotta' finish, said Mustin regarding their performance. I want my team to know that they can depend on me for anything they need from me, whether it's the sprints, the hurdles, or the 800m." Jayde Charlton ran the third leg of the relay after finishing 4th in both the D2 Girls 100m Final and in the D2 Girls 200m Final. 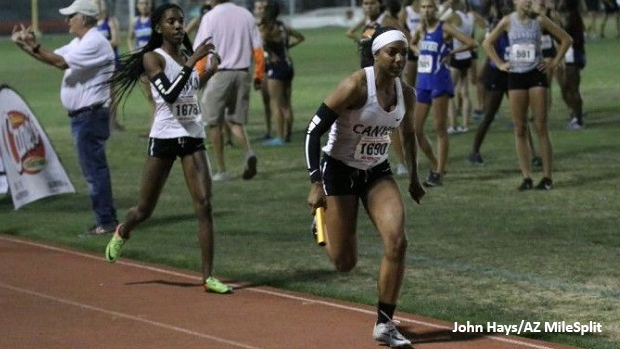 An interesting note, Jayde Charlton's older sister Lameyah Charlton (Chandler, 2017) was part of the Chandler Girls 4x400m team that broke the State Record, the year before. Finally, Jadyn Mays the always dependable ace for the Rattlers shut it down for ladies of North Canyon. On the first day of the AIA State Championships, Jadyn Mays handily won her preliminaries in the 100m and 200m dashes, and also became a repeat D2 State Champion in the Girls Long Jump. During the Saturday finals, she recorded AZ no. 1 performances in the 100m and 200m dashes and anchored her team to clinch the State record. this post is for my girls, as ALL sophomores we broke the state record in the 4x4 last night! these girls push me everyday in practice & i wouldn't trade them for the world:revolving_hearts: .. & funniest part to the story everyone agreed on "big chillin" before this race, so ig we should chill more often ;) #sophomoreslump?